Nuclear Coffee Recover Passwords - это приложение, с помощью которого Вы сможете восстановить любой пароль из более чем 100 программ, в том числе таких популярных программ, как Mozilla Firefox, Opera, MSN Messenger, Microsoft Outlook, и т.д. Программа с легкостью просканирует Ваш компьютер, а также компьютеры в Вашей сети и выдаст нужные и забытые пароли, которые можно сохранить в TXT, HTML, Word, Excel, PDF, CSV, XML форматах, а также распечатать на принтере. 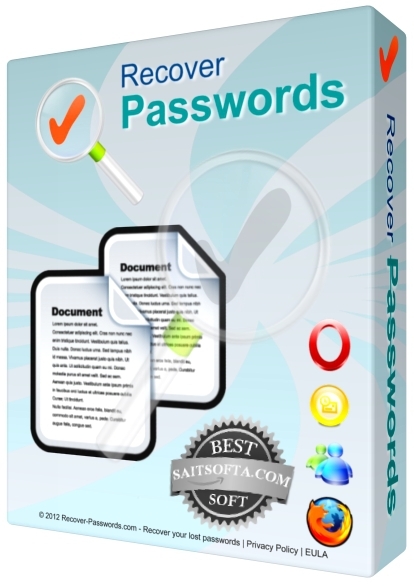 • Recover passwords from 108 installed software programs, including such popular programs as Mozilla Firefox, MSN Messenger, Microsoft Outlook, etc. Here is the full list of supported programs. • As additional feature retrieves usernames, and any other related information if available. • Export recovered data to Text file, HTML, Word, Excel, PDF, CSV, XML or tab separated files. • Scan remote network computer without installing anything on remote PC. • Scan all network computers. You can enter IP range, list of IPs or just list of computer names (useful for those who're using DHCP server). • Recover Passwords can scan multiple remote PCs at the same time; this will save you a lot of time. • Nice looking intuitive user interface, but with solid amount of options. • Easy customizable and nice looking printing. • Free and friendly technical support. We add any possible software to Recover Passwords at your request.